I think I'm falling in love with my parts car. 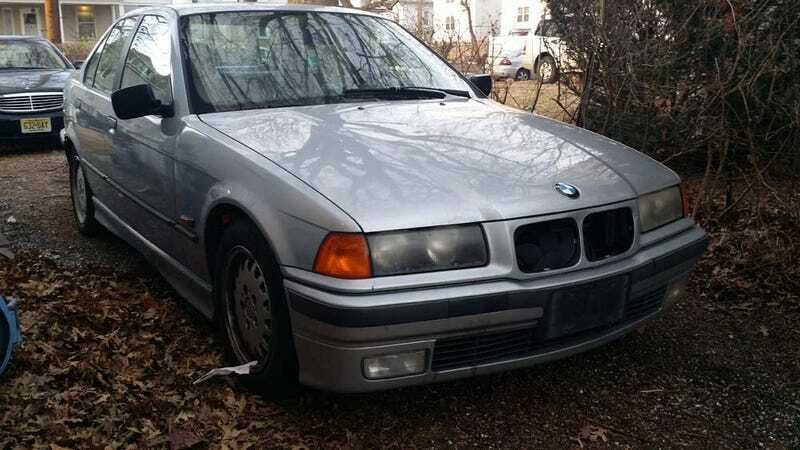 I got this '96 BMW 328i Automatic for parts for my E36 M3 restoration. I bought it for $700 on Craigslist, got it non-running, and the owner said it needed a new engine. I put a new battery in and turned the key just for fun, and it started and ran without a problem. I didn't run it too long because it looked like it was about 2 quarts low on oil and the coolant reservoir was cracked and spilled coolant all over the engine bay at one point. The valve cover was leaking as well, but it seemed like everything else was running great. No smoke from the exhaust, no weird smells. The only fault code that came up was for an O2 sensor. I'm really thinking about fixing it up and flipping it. I think it would clean up VERY well and make an amazing daily driver for someone if I take care of all of the neglect this car dealt with in its life. Heated leather seats (not the cheap vinyl), dual-zone climate control, and the AC works well. It's a really solid car and I think I like it just as much as I do my M3.